Here you will find the world’s most popular and easy to make vodka cocktails. There are thousands of vodka cocktail recipes around, so it’s a challenge to find the best ones. Cocktail Mixing Master goes to great lengths to find the most popular and simple to make vodka cocktail recipes. Vodka originally comes from Russia and most Russians like to drink their vodka neat. So does James Bond. Vodka is ideal for the beginner bartender as it goes well with just about anything. If you want to experiment, vodka is your spirit of choice. TIP: Go to our Cocktail Mixing Guide for an explanation of the terms used on this page. Preparation:Shake the ingredients and strain into the ice-filled glass. Arguably the most famous and widely drank vodka cocktails of all time. Perceived by many to be a great hangover cure. (Click here to go to our Hangover Cures guide.) Another cocktail with as many variants as there are bartenders. Preparation:Put the vodka and tomato juice in a shaker with a few ice cubes. Add the tomato sauce, Worcestershire sauce and Tabasco sauce. Shake well and strain into the glass (which can be with or without ice). Add salt and pepper to taste. 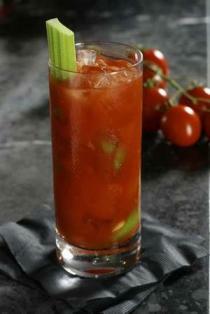 Garnish:Celery stick, which serves as a stirrer as well. Works well with a few drops of lemon juice too. A popular after dinner drink. Preparation:Pour the ingredients into the ice-filled glass and stir gently. Replace the vodka with whisky to create a “God Father”. This is a surfer’s drink, perfect for sunny summer’s days. It is said to have been invented by a surfer, Harvey, who was eliminated from a surfing contest in California. He drank a huge amount of vodka and Galliano and banged his head against the wall in despair. Preparation:Shake the vodka and orange juice and strain into the glass, with a few ice cubes. Float the Galliano on top. Garnish:Slice of orange, cocktail cherry. Also know as “Love Potion”. A very straight-forward drink and rather a mixed alcoholic drink than a cocktail in the true sense. Still a classic, very enjoyable and one of our favorite vodka cocktail recipes. Preparation:Pour the vodka and orange juice into the ice filled glass and stir gently. It is believed that this drink was first created in the 1950’s by American engineers working in the Middle East. They added orange juice to their vodka and stirred it with the closest thing – usually a screwdriver. Originally called “Sloe Comfortable Screw” as it was made with sloe gin, Southern Comfort and the ingredients of the Screwdriver. These days, many bartenders prefer to use “normal” gin. Preparation:Shake the vodka, gin and Southern Comfort and strain into the glass. Top up with orange juice and stir gently. Garnish: Slice of orange, optional. A variant of this cocktail: Float a 0.5 parts Galliano on top to turn it into a “Slow Comfortable Screw Against the Wall”. A cheerful drink guaranteed to put you in a good mood. Preparation:Shake the ingredients with crushed ice and strain into the glass. Garnish: Cocktail cherry on a stick. It is not uncommon to replace the gin in a gin based cocktail with vodka and put “Vodka” in front of the name. For example, the vodka martini. This is another example. Another quick and easy cocktail. Preparation:Shake the ingredients and strain into the glass. Also known as a “Stealth Martini”. Commonly made in London and New York. Garnish:Orange, lemon or lime slice. Try this if you like grapefruit juice or have a taste for bitter things. Glass:Martini, although a highball is sometimes used. Garnish:Salt frosted rim for the glass. Need we say more? A modern classic cocktail found on the majority of cocktail menus around the world. Check in frequently as we update and expand the cocktail recipes often. *Cocktails marked with an * are official International Bartenders Association (IBA) cocktails. In some cases the recipes here do not correspond exactly with that of the IBA. What information, services or products do need? Let us know - we will find it for you. Which page(s) on this website did you find interesting? Do you want to receive free offers from us via e-mail?